Ladies and gents, let me ask you, do you remember the shirt your first date wore? How about the brand of shoes? Would she be carrying a bag? Wore a piece of knock out accessory? There is more to perfume than its composition of notes. I believe, there are certain aromas that bring a whiff of the past, somewhat like your first date, that kiss, the scent of spring during your childhood, the scent of flowers from your most memorable trip or perhaps a heart break. Just as how the founder of Whiff gained the inspiration to come up with a medley of fragrances. While recovering from a broken heart at Grasse, France, Mishy Co realized that perfumes were a perfect way to channel her energies away from her hurtful experience. Short after she created “Heartbroken collection,” and it eventually became a cult fave. From there, the new Whiff comes out in the market. With the new packaging, in clear glass and gold elements, it invites the discerning trend setter who finds pleasure in discovering that specific scent bring out their own personal sense of style. The elegantly designed fragrances highlights Whiff’s artisanal values. Aged to perfection, Whiff features the finest fragrance oils expertly blended in small batches. Together with RJ Lopena, a world-class craftsman, the team elevates the formulations to world class standards that make it compliant with the most rigorous quality standards of the Philippine FDA as well as other regulatory bodies abroad. The collection labeled as Whiff Re-imagined has the five classic scents and the three new ones created by RJ Lopena. Top-selling blend of fresh nectarines, peaches and black currants more potent, with the fresh cologne-like quality you’ve always loved. It is a floral and fruity fragrance. A unique, fresh, fruity and herbaceous fragrance. Crisp fresh pears blend with Freesia, patchouli and white musk bring an invigorating fresh fragrance that both women and men love. A refreshing blend of lime woody cedar makes this wonderful fragrance equally loved by men and women. Romantic Gardenia flowers in full bloom mix with pomelo and other citrus fruits to deliver this unique floral fragrance that celebrates everything good about being a woman. Whiff's homage to the Queen of Philippine fruits. Immerse yourself in the scent of freshly picked mangoes right before they ripen so it’s sweet, but refreshingly tart. It’s a Whiff innovation that may be the first of its kind. Aromatic pine notes complemented by refreshing lime result to this unique blend that Whiff believe will be used by both men and women. I'm so loving all these variants but my most favorite is the Nectarine Passion, Pacific Rain and the Mango Verde. These 8-bottle packaging puts me in the mood for a typical scent every kind of day. These new refreshing scents are your best accessories in creating more enduring moments. Whiff comes in several sizes and prices: 50mL (P595), 30mL (P395), and 15mL (P250). 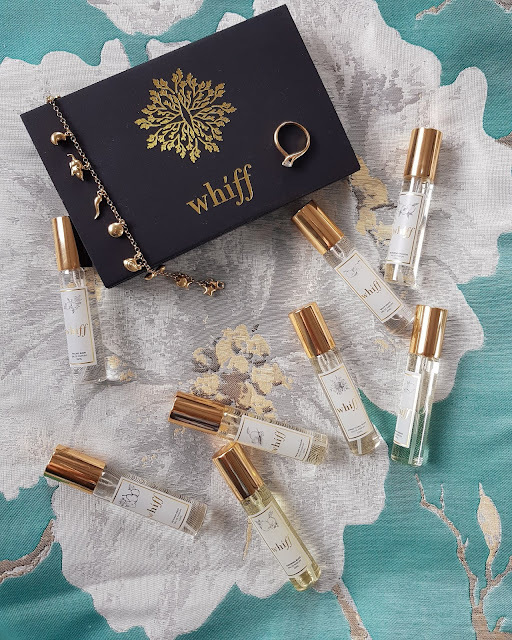 To get more info about Whiff, visit their Facebook page here and in Instagram at @WhiffofPerfume. You can order online thru their Facebook or Instagram accounts or visit Retail Labat the 2/F Power Plant Mall, Makati. Iba parin talaga kasi pag may perfume ka iba yung dating. Nakakadagdag ng charm. I'm excited to try this one 💕 yey !